These are the recent creation, all has been posted on Etsy since last week, some are already sold! Lately my routine has been changed, which is to make a lot in one day whenever I can get going, then take a break next day if possible, rather than constantly trying to push something out every single day. March's birthstone is aquamarine, which I made a few and added to my collection. It would be fun to find out some legendary tales on this dreamy beautiful healer. I may post it some other time. Lastly, look at these humongous chocolate coated strawberries, which never tempted me to taste for some reason, but turned out, it was so delicious and dangerous! I liked them. And Valentine's roses, they are still in a beautiful shape, releasing a lovely scent. It will be another rainy weekend over here. Took a visit to down town Fullerton on a rainy Sunday evening. Just 30 minutes drive but this was my first time in Fullerton. The destination was this tea lounge called "Tranquil". Oh I enjoyed the good tea in this cute little tea shop. This must be a very popular spot too, although the whole town looked empty because of the pouring rain, the place was so crowded, people kept coming in that all tables were constantly full. I had a green tea called "gunpoweder", which was a little smokey and I liked a lot. This is where I create. New tools are getting introduced slowly by slowly.. Circles, which has a nice handcrafted organic appeal, centered by a teardrop of gemstone. Which stone would be your choice? Amethyst, its history goes all the way back to Ancient Egypt, being worn and worshiped - especially as rings, by high priests and bishops in Western world throughout centuries. In the Medieval Ages, amethyst was called "Soldier's Stone" as soldiers started wearing amethyst-accented rosaries. In Eastern world, back in Qin Dynasty, this purple beauty was crushed into powders, taken as a valuable medicine to cure diseases and pains. Interestingly, not the stone yet the color purple was considered noble in Japan, as the highest in Twelve Level Cap and Rank System established in the year 603. The name amethyst derives from the Greek word amethustos, meaning "sober" or "intoxication". One of the ancient legends says that amethyst is an incarnation of a girl who was about to be attacked by the tiger that was manipulated by a drunk and angry wine god, Bacchus. Moon goddess Diana, the girl's master, then turned the girl's body into a clear crystal quartz right before the attack. Bacchus regretted his cruel act, he poured a red wine over the crystal, which gave the stone a beautiful purple hue. .. The other version, which seems to make more sense, is that the goddess did such a thing out of the jealousy of the girl, whom Bacchus was falling in love with. Either way, it's a tragedy! Amethyst has had strong religious and spiritual meanings throughout history. In today's world, February's birthstone, amethyst is known as "nature's tranquilizer", a great talisman to enhance one's creativity and passion, to lead business success. Beautiful blue topaz faceted pear bezel-set uniquely in side way, giving away elegant sparkles, balanced off with the rustic oxidized finish adding a simple casualness to the necklace. February's Newsletter - Valentine's Day Sale! View all the sale items here! Took a short trip to Carlsbad State Beach yesterday. Our original destination was San Diego but the traffic jam seemed to become worse and worse so we decided to take the next exit off the freeway, heading for the nearest beach. This unplanned wanderlust took us to the spot that exceeded our expectation. I loved how the rounded pebbles randomly lay on the sand, the reddish layer along the shore adds a dramatic effect to the view. Damp looking bright green toned algae clinging onto the rock, which might get soaked all the way up by the water during the high tide every night. Despite more and more people showing up to watch the sunset, all the clouds out of nowhere began to cover up the sky and completely hide the precious sun. The disappointed audience started to leave. Oh well, no sunset today, but instead, amusing ending was the lovely pair of pelicans flying across the gloomy sky. Carlsbad State Beach became one of my favorite beaches in Southern California. 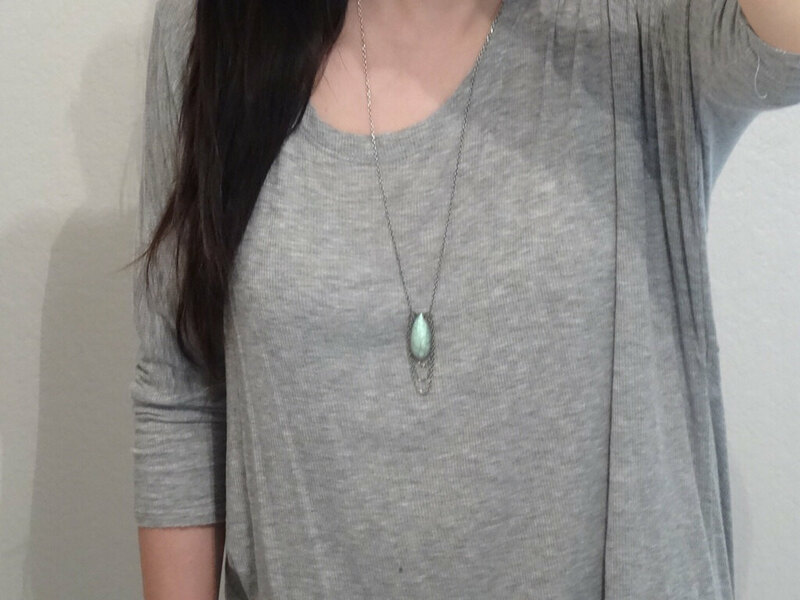 Smooth pear shaped labradorite on long oxidized sterling silver chain in a drape style. Measures 24" plus 1" extender. Hand-sawed, oxidized sterling silver heart necklace, accented with freshwater pearl. Copper heart overlay (on sterling silver) soldered on sterling silver bead band. Unique natural shaped petal pearl centers, joined by sterling silver disk with turquoise, amazonite , coral. and vermeil gold bead. Casual beach chic one-of-a-kind appeal. The half of January was spent at home because of a bad flu I caught. So, I wanted a good getaway this weekend, the last day of the month. Living in Orange County, a little getaway would be either San Diego or Los Angeles; South or North on highway 405. Due to the late departure, the destination was set on Santa Monica, 50 miles North. Parked the car at the beginning of the Third Street Promenade, we walked all the way to the other end of it. Shops are not much of my interests but what's powerful in this place is the vibe of "the freedom of expression" released by numerous street performers and musicians. Voices and instruments stop the pedestrians' steps, keeping the place vibrant all day long. By the time we hit the end of it and started walking back the way we came, the sky on the left hand side was turning orange. Off the route we went to enjoy this evening beauty before heading back to the car.